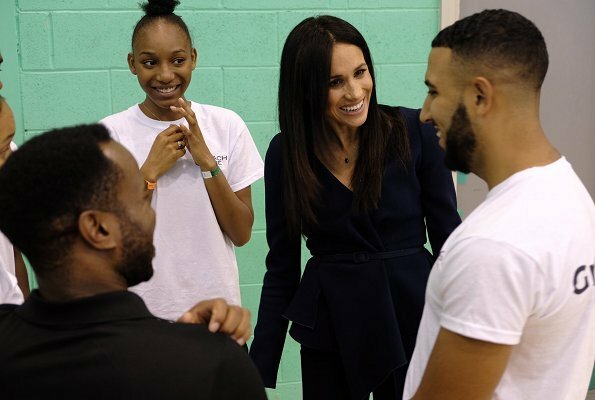 The Duke and Duchess of Sussex attended 2018 Coach Core Awards ceremony held at Loughborough University on September 24, Monday. 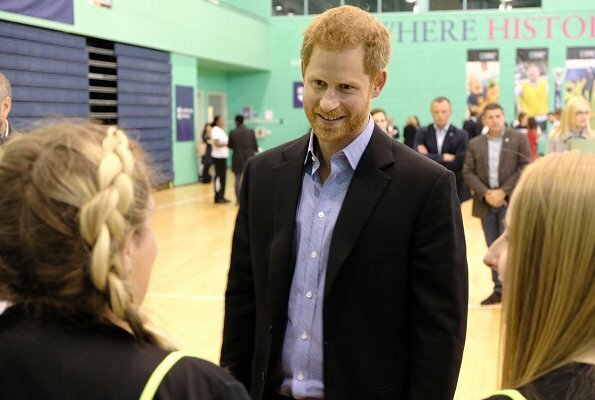 The Duke and Duchess met with some of the apprentices and took part in drills and team games, and afterwards the Duke and Duchess met with this year's graduates. 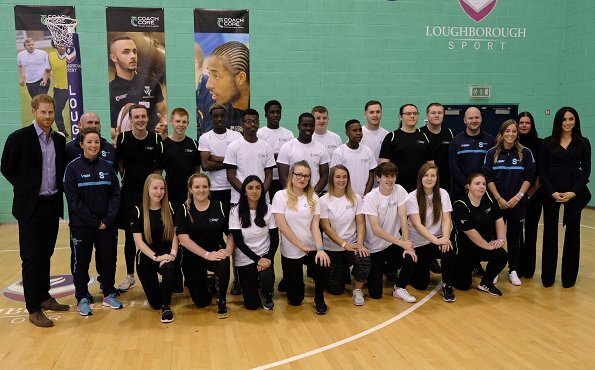 Coach Core was established by The Royal Foundation in 2012 and the purpose of Coach Core is to benefit from the power of sport and its ability to change lives, and to empower young people. Love the top, the handkerchief corners makes this top elegant. But I must say a lot of material hanging around. 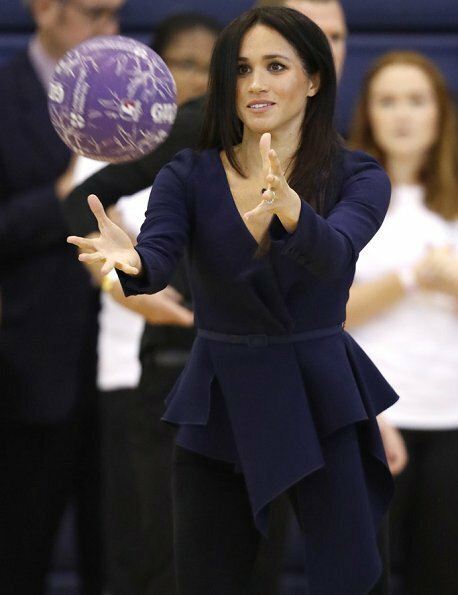 Meghan can carry this one off with ease, the black pants is OK with it but I think she should have had one with the same navy color. But she looked good anyway. This is a cute top. I also love these pants on her. While navy and black can be worn together now (it is not the 1950s anymore), I would have preferred to have seen them split up. The top would have looked better suited. Her hair has been shaped to add fullness while retaining versatility. I can't be bothered to worry about her shoes on the floor. She is not playing on it. That is just being petty. Not good. First, she is wearing spike heels on a gym floor. The first rule of sports is you do not ever wear hard sole shoes, heels, etc. on a basketball court, gym floor, etc. Those floors are highly polished and scratches are disasters for those type floors. Second, is that top dark blue? It looks like it is navy blue with black slacks! I have never been a fan of wearing navy blue with black or mismatched blacks. Make a long story short, heels - no, outfit - no, and then there is the hair! If you are going to participate in sports, then long haired girls know they tie their hair back in a pony tail or wear a headband, etc. to keep the hair out of the eyes. She was not prepared for this event at all. I fully agree about not respecting rules on a gym floor. It is a bad example. I would prefer dark blue for the whole outfit instead combining black and blue. For the rest I am far more tolerant. The hair is ok for her, she is not participating in a sport competitiion, but attending an award ceremony. In short it is a show. I like a nice piece of jewelry. It is ok Meghan. She's not participating in sports - she's throwing a ball a couple of times for the camera. Harry's wearing a suit - clearly they haven't come to take part in any serious exercise. Franny, you never wear stilettos when walking on wooden floors. They leave permanent marks. You should see my floors that have been marked by an inconsiderate woman wearing spikey shoes. I didn't make any comment about the stilettos. About shoes, the organizers should have prepared for that and make available for her some sorts of overall slippers. Maybe she did not know about the details of the rooms. All the events royals attend are highly organized. HIGHLY organized. If there were restrictions about shoes on the court, that would certainly have been communicated beforehand. Je n'aime pas cette tenue. I don't particularly like navy and black together and I'm not keen here. However, I like both the trousers and especially the blouse. She looks good. She should have had her messy knot there. No sense of what to wear when. No to the heels. She is NOT dressed for that event. This is a very exagerated opinion, criticism is so easy. J'adore cette tenue, elle est magnifique! Meghan est vraiment belle et elle remplit bien son rôle. Ne cache t'elle pas quelque chose ? She looks very good. The top is very a good model for the tiny person as Meghan. It gives her some curves. And the trousers make her legs look soooo long and beautiful. The top is a bad choice for this event. She should have her hair tied as a pony tail so it would be perfect I think . I like her make up . No we can not wear shoes with heels on a gym floor! Always so much negativity about Meghan. Pity! She looks good, mature style. Her hair is better than the style of some queens. Although a pony tail would have been fun.. but she is not Kate.. the messy bun would be better.. Completely agree with KarenAR. Top is too high fashion for this type of event and a bit strange looking. No to the blue and black and the heels on a gym floor. A definite NO to black + navy. The trousers are nice, good fit, look good with heels (but ouch to the gym floor). The top has too much fabric (the longest bit at least needs to go), and what an odd choice for the event. Wrap tops come undone so easily, and clearly this one here doesn´t sit right either after she moved around a bit. I like her hair, this style fits her well imho. If she was anyone else, she would have been told to take her shoes off. Previously, I have noticed many of the royal women wearing heels on gym floors but it was never commented upon. Yes, you are absolutely correct, but it is Meghan. We must not complement Meghan. Meghan can only do wrong. This has gotten so old, yet it continues. I like the outfit,but would have preferred more tailored slimmer trousers to balance the volume of the top. She should have had a change of shoes ready. I've had to play basketball barefoot because I didnt have proper shoes for a gym floor. You dont wear heels on the floor. I like the top, but i don't think it's ok for this kind of event. About the shoes, she could just remove them as Maxima did it not long ago in a very similar event. Maxima carried her heeled shoes while in the gym a few days/weeks ago. Being in the gym on high heels, maybe she doesnt want to show her feet in public any more. There was a lot to do concerning her toes, not her best part im afraid. Nice outfit anyway. 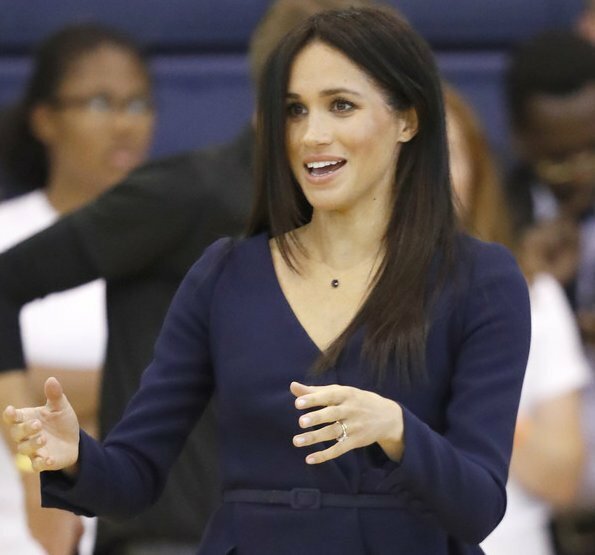 If other royals can wear high heels visiting gym,so can Meghan. I am not a fan of her,,but picing on Meghan that really try her best is not cool at all. People who don’t like you, criticize you always, no matter, how perfect your outfit is. Meghan - don’t worry- you cannot be everybody’s darling. The beautiful Duchess of Sussex is doing a great job. Except the shoes everything is perfect, especially her hair. Wish them all the best!